We don’t have a car. This is not an issue. With excellent public transport (trains and buses) and most things well within walking distance, we don’t really need a car. That being said, my poor takkies (sneakers/running shoes) are taking a beating. And don’t get me started on walking in my boots or ballet flats. And my feet! I gave calluses on calluses. On Friday Paul and I walked around running some errands. Everything was within a kilometer or two of our house, but everything was in different directions. We walked over 13km and only took the bus in the afternoon when the kids were with us. Yesterday there was a kite festival in Modi’in. It looked like fun so we decided to go. We mapped out our walk on Google Maps and in theory it was a 35 minute walk over 2.8km. We have a cram (Crappy pRAM) that we push Faith in, there is no way we would walk anywhere further than 500m without Faith being in the cram, she is slower than a turtle walking behind a snail. Going backwards. Things started looking wrong when Google (bless it) decided to take us up a rather long flight of stairs instead of on the road. We changed over to ‘car’ mode and the directions switched. To a road on a very very steep hill. I did get to take this awesome pano of our beautiful city though. Ultimately it took us about an hour and 4km of walking to get there. But once we were there we had fun. 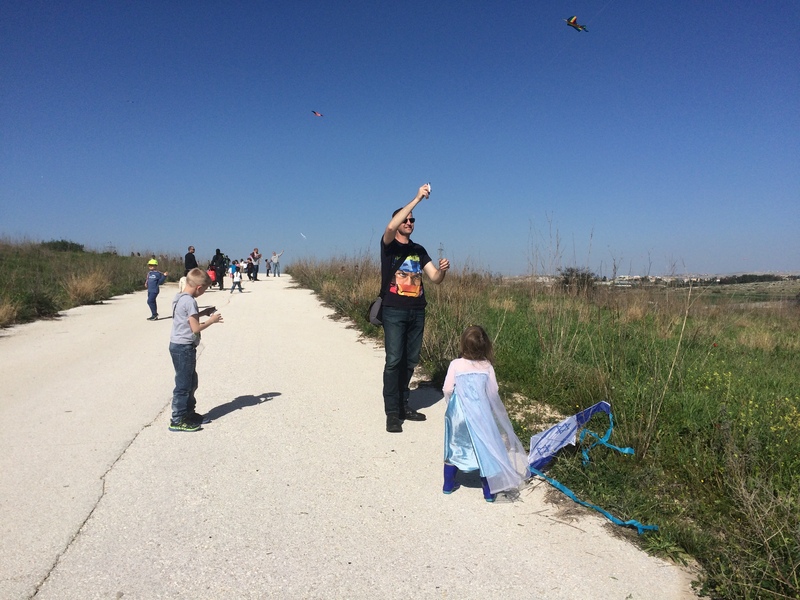 we bought kites for the kids and some popcorn and drinks and spent a good hour or so flying kits. The walk back was about 4km too but Paul managed to find a route without Mount Everest in it. In total we walked almost 8.5km yesterday. Most of the time I dont mind not having a car. The last two days though… Yup, I would have LOVED a car!